Ed. 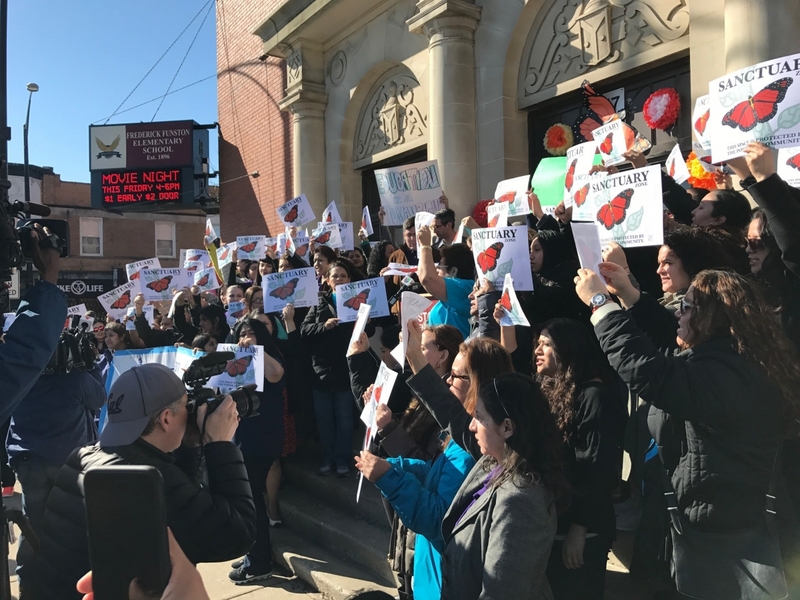 Note: Today’s post comes to us from our allies at Logan Square Neighborhood Association, who have been working with young folks to build sanctuary schools that protect our students and their families. We’re excited to profile their work here. Jennifer Velazquez leads the club Estudiantes Sin Fronteras (Students without Borders), a partnership between Logan Square Neighborhood Association and Schurz High School. Estudiantes sin Fronteras develops student leaders to work on immigration issues in order to create a welcoming and resourceful space for all at Schurz. At 4:00pm Friday, May 26th I received the email. It was a gofundme.com page for Alberto, a Schurz High School dad who was picked up by ICE while taking his kids to school, detained, and given a bond of $6,500. When I read this it became personal, not only because I was working at Schurz, but also because my father was deported while I was in high school. I remember feeling like the world had ended. I had hope that things would go back to the way they were, but they never did. It was a feeling I knew all too well, one that I did not want any other child to experience. With the power of social media, the Schurz community, and Logan Square Neighborhood Association’s sanctuary network, we met the fundraising goal 26 hours later. It was truly something amazing to see. When I saw the picture of the father after his release, I cried. It was a great victory, and there is so much more we can do and must do to keep our families together. How did we get here? Just seven months ago, our Estudiantes sin Fronteras group met the day after the election. With sadness, anger, all mixed with confusion, we sat and thought, “What do we do now?” Even though on the inside I too was confused and angry I tried my best to keep their spirits up. The young people began to say parents and students urgently needed information about their rights, where to get lawyers who wouldn’t just take their money, and what to do if someone is taken by immigration. No network of loving, caring people goes as deep in every pocket of the city as teachers and paraprofessionals. Together, we have the power to build and activate a true sanctuary network. First, we created a Know Your Rights Video available on YouTube. After creating the storyboard and script, students prepped, trained and practiced. Next, we got the principal to commit to an all-staff Know Your Rights training. The students presented to the 100+ Schurz school staff for an hourlong workshop and prepared them to have hundreds of “Know Your Rights” conversations on Report Card Day. Then, we asked teachers to join us in defining what would make Schurz a “sanctuary school.” When we say “sanctuary school,” we mean a place where teachers and families stay informed; feel protected and respected; and come together to take action. Estudiantes Sin Fronteras created a space at Schurz where we could talk about immigration issues. It became a club for many. Teachers have taken the students’ lead and are integrating sanctuary-related discussions and projects into their classrooms. Teachers and families know who to contact in case of emergency. It was this continuous stream of information that led to Alberto coming back home to his kids (at least for now.) When he was picked up by ICE, his wife called the school’s counselor, and the plan kicked into gear. Alberto’s release is one step and we have the power to do much more. We can work to amend Chicago’s Welcoming Cities ordinance so that our city’s sanctuary status is more meaningful. We can urge the Governor to sign the Trust Act to limit cooperation between ICE and the Illinois State Police. We can end cash bail and punitive discipline systems that target Black and brown families alike. Seeing a community organize itself to keep a family together made me wonder how many other students might be going through something like the Alberto’s family. Teachers, please know that just mentioning immigration issues or the Welcoming Cities ordinance could be what encourages students to be more open about immigration situations going on at home. You don’t need to have all the answers, but reaching out to your colleagues or your neighborhood’s community organization for resources is one step in the right direction. guest post, high school, Immigration, racism, sanctuary. Bookmark.